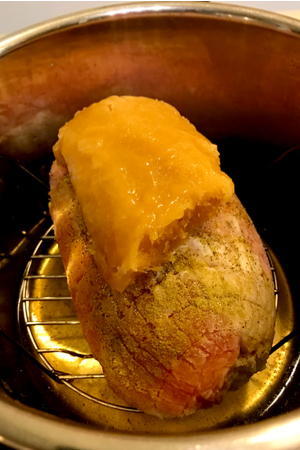 Making an Instant Pot Frozen Turkey Breast Roast will change your life forever! No more chewy and dried slices of turkey breast for dinner. And if you forgot to pull it out of the freezer to thaw it, no worries – you cook it directly from frozen! 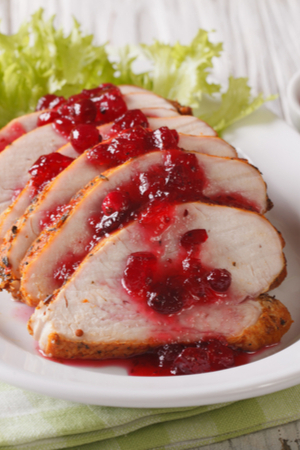 Moist and delicious turkey breast roast made from frozen in the Instant Pot and served with cranberry sauce. Several people have asked me to provided a recipe for cooking a turkey breast roast in the Instant Pot. Not only for Thanksgiving dinner, but for an easy-to-prepare main dish recipe for any night of the week. My first thought went to a typical oven-baked Thanksgiving turkey. The thighs are moist and juicy, but the turkey breasts always come out dry and chewy. So I knew that if I was only going to cook only the turkey breasts, I could adjust the cooking time specifically tailored for the white meat. Off to the grocery store I went to find the perfect turkey breast to make in the Instant Pot. This recipe was tested with my 6 quart Instant Pot and a Butterball frozen 3 1/2 lb. turkey breast. We always bought whole turkeys for Thanksgiving dinner. And I always buy them frozen solid. After a cool water bath for a couple of days they are thawed out just in time for the big day. I found a frozen, boneless turkey breast roast in the case next to the whole turkeys. They were frozen solid. Having no time to thaw it out, I knew that I had to make it from its frozen state. The first step was to remove the plastic wrap off the turkey. That is where the obstacles arose. Most store-bought turkey breasts come sealed in a plastic wrap. It is easy to remove, if it isn’t frozen in cracks and crevices of the turkey breast. Place half of the gravy packet on top of the turkey breast before cooking. Simply cut across the top and down the sides of the plastic. Be careful not to cut into the flesh of the turkey. Peel the plastic wrap off and discard. On some bands you will also find a netting that encases the meat. This removal task is a little more challenging. The fibers of the net are actually frozen into the skin. You must carefully pull the netting away from the skin without removing any of the meat. I used a small pair of scissors to snip several sections of the netting and carefully pulled it off. Once the turkey breast has been sliced, you will see how moist the turkey breast is. One final step was necessary before I could lower it in the Instant Pot – removing the gravy packet. This seems like such an easy thing, however, once again, the gravy packet was intertwined into the folds of the bird. With a little bit of prying, the gravy packet popped off. Yes, it had a little hole in it, but that didn’t matter. I was going to use it anyway. I poured chicken stock into the liner of the pot. Of course you could use turkey stock, beef stock, or even vegetable stock if that is all you have on hand. And because the turkey gravy packet was already partially torn, I decided to pour half of the gravy in with the liquid. Add the trivet and place the frozen turkey breast on top. Rub a little oil on top and sprinkle on your seasonings. 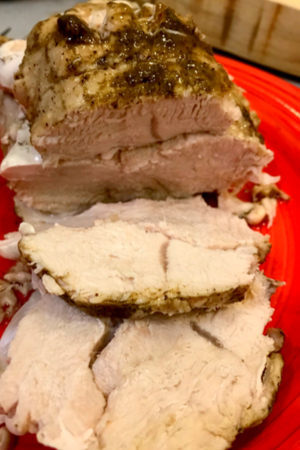 Instant Pot Frozen Turkey Breast sliced and ready to be topped with gravy or cranberry sauce. With the remaining gravy, place it on top of the frozen turkey breast. My gravy was still mostly frozen, so I set the entire chunk directly on top of the meat. I closed the lid and waited for the magic to happen! The absolutely most delicious and moist turkey breast that I have ever had! And be sure to use the liquid left in the pot to make a thick and delicious gravy! Or if you prefer, use the leftover drippings for stove top Turkey Gravy. 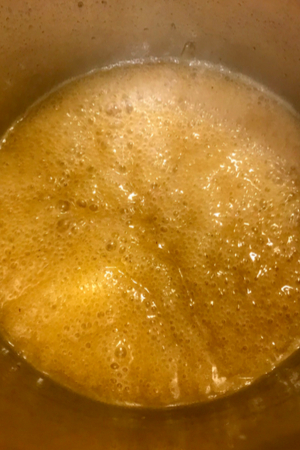 Use the liquid in the bottom of the pot to make a delicious turkey gravy! 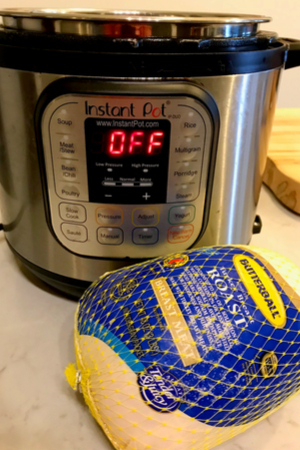 So for this year’s holiday dinner, make this Instant Pot Frozen Turkey Breast recipe and you will be AMAZED!!! And if you have any leftovers, be sure to make Turkey Tetrazzini for a great one pot meal. For those who prefer Ham for dinner, try our Instant Pot Bone-In Ham recipe. It is just as good! 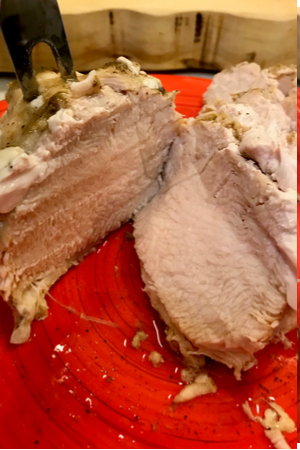 Surprisingly moist and delicious turkey breast made from frozen in the Instant Pot. Remove outer coating and netting (if applicable) from the frozen turkey. Carefully remove the gravy packet if your turkey breast comes with one. Pour the broth into the liner of the Instant Pot and add 1/2 half of the gravy packet and stir. Add the trivet and place the turkey breast on the trivet. In a small bowl mix together salt, onion powder, garlic powder, poultry seasoning and thyme. Set aside. Drizzle the top of the breast with the oil and sprinkle seasonings on top. Set the remaining frozen gravy packet on top of the turkey breast. Close the lid of the Instant Pot and place valve in sealed position. Pressure Cook/Manual on High Pressure for 50 minutes. After the cooking time expires, allow for 10 minutes of Natural Pressure Release. Quick release any remaining pressure. Remove the turkey, cover and set aside to rest. Cancel the Keep Warm Function and turn the Instant Pot on Sauté. Remove ¼ cup of the liquid and whisk in 1 tablespoon corn starch or arrowroot powder to make a slurry. Pour the slurry back into the pot and whisk mixture until desired thickness has been reached. Slice turkey breast and pour gravy over top as desired. If you want to crisp up the skin of the turkey breast, place under a broiler until browned. Thanks for sharing. I’m excited to try this. Any ideas for how long to cook if it’s fully or partially thawed? I’m still new to the Instant Pot and I haven’t fully mastered it. The cook time for frozen meats stay the same (unless the meat is in a large clump). It just takes longer to come to pressure. Hope that helps!